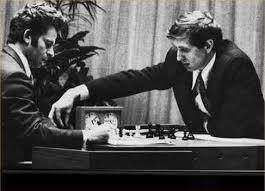 Seen as symbolic of the political confrontation between the two superpowers, it was called “The match of the century.” At the time, the Soviet Union had dominated in chess for the previous twenty-five years. 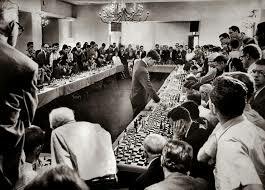 Included in the prime time media frenzy about our American chess genius was a story and photo of a previous exhibition where Fischer played 50 opponents simultaneously. With that image in mind, I participated in, watched, and listened as a fierce storm blew into the Wasatch Front and instigated a railroad chess exhibition, where our Railroad Grand Master Controllers were suddenly called to play their own 50 opponents simultaneously. MOW was a few miles away but responded to the call. Power was out at the Layton south control point. This was soon followed by the report of the track “showing occupancy” between Clearfield and Layton. More calls continued describing more problems up ahead of me. I didn’t know it at the time, but Utah had just experienced two tornados right ahead of me. Right here in Utah, where even a single small tornado is a rare event. Before I could get the 20 minutes down the line where this troubled area was, many supervisors and MOW personnel were on the way to inspect the track and man the switches that would now need to be operated manually. However I-15, the freeway along our track, also suffering from the blast of the storm, was gridlocked and our reinforcements, now caught there, were going no where fast. By the time I arrived at Clearfield Station the “Occupancy” reported earlier had cleared and I was given the directive to proceed at Restricted Speed almost all the way to the next station, which was Layton. Where 79mph was normal, this was a rather long way to go at a maximum speed of 20 mph. But with the mandate to “be able to stop within half the range of vision” of a whole list of possible hazards ahead of me, I went slower than that for much of it. There were lots of debris strewn along the railroad right-of-way that Union Pacific and FrontRunner share through that stretch. Mostly tree limbs and other small items strewn up very close to the rails. I had to proceed slowly enough to sort out what I was seeing, determine if there was anything that might cause damage to the rails or the train, and be able to stop well before encountering such a threat. Eventually, I came to a mostly intact metal roof blown from a nearby building. It was just off of our rails but it covered some of the UP tracks. This was the most likely cause of the earlier “Track Occupancy” that originally showed up in the Control Room. I’m sure that continuing wind from the storm had moved it just off of our rails before I had arrived, allowing my train to cautiously venture beyond the Clearfield Station. After I finally arrived at Layton Station, my train had to hold there and wait for the northbound train, which was now caught behind the dead South Layton signal and switch that splits a siding off the mainline track so trains can “meet” at the station. Because of the traffic gridlock on I-15, MOW and the Operations Supervisors still hadn’t arrived to help. So the Engineer of the northbound train had to tie down his train, and go down on the ground to manually throw the switch for his train to enter the siding into the station. Besides the process of unlocking it, taking the switch out of automatic and manually cranking it to the proper position, specific radio protocols with the controllers must be followed throughout the process. Once this has all been completed and the engineer is back on his train, which has once again been made ready to go, he now communicates with Control as they follow another set of radio protocols allowing his train to proceed past the improperly displayed signal. With my train moving from Clearfield Station to Layton Station at mostly 10-20 mph where 79 mph is normal, and the wait while the northbound train worked his way through his signal and switch issues to finally make it into the Station, by now we were really running behind schedule. The MOW first to respond finally found some back roads that got him to the troubled switch and signal up ahead of me just in time to manually line the switch for my southbound movement so I didn’t have to tie down my train and do it myself. I still had to go through the red signal by-pass procedures which of course continued to delay us even more, but we were finally moving away from the worst of the storm zone. Problem was, my train was now so far behind schedule that I was out of sync for meeting each of the oncoming northbounds and so I repeatedly had to wait. Now, the numbers of waiting passengers at each station swelled because it had been such a long time since a southbound train had been through. This further delayed my progress as these many irate passengers overcrowded into my late train. By now I was so late that passengers, used to boarding the train behind me, arrived at each station thinking I’m trying to depart a few minutes early. 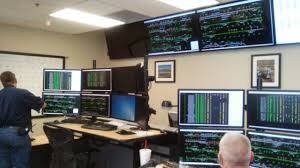 UTA Warm Springs Control continued to scramble, trying to manage everything going on and somehow get the trains back on schedule. Among many other things I’m sure they were doing, I observed or was aware of the following. With an increasing number of trains now running substantially late, they added at least one extra train to help take up the headway for the many commuters (our King) trying to get home. Extra trains and regular trains falling back to later headways of course increased the management complexity as the already busy single track corridor was even more crowded and the crews on various trains were working other than their normal headways and trains. At some point, these crews needed to be shifted to their correct work positions so they could end their tour of duty at whatever location their work ended and before exceeding their maximum allowed hours of service. Several signals continued to malfunction for some time, requiring Control to continue directing the ground personal who were manually “throwing” the switches, along with the cumbersome process required of them for the trains to proceed after following the “Red Signal By-Pass” radio protocols. Along with the signal problems there were three “Crossing Protections” that stayed in affect for many hours. Each of these crossing protections were separate “Mandatory Directives” that had to be given to each train (when stopped so they could be written down) and then read back to confirm that each detail was exactly correct. The train engineer then had to proceed up to each crossing at a specified speed, while sounding a specified horn sequence. Control needed to keep track of which train and which engineer had received each crossing protection. Because these crossing protections continued for so long, Control needed to reissue the crossing protections to the “new” engineer after the crews rotated out but before they reached the crossings under protection. When the crossing protections were finally released, Control needed to contact every train and every engineer still on duty to void each crossing protection. Along with keeping track (and directing) of the mayhem on the mainline, the required paperwork they now needed to keep up on was just as intense. Along with what I’ve already mentioned about documenting “Crossing Protections”, MOW’s access permits to the mainline track via “Track and Time” and “Fowl Time”, keeping track of what trains were running in what headway, and who the crew members were on all these train in this now mixed up system, they now had reports to complete every time a train departed a station more than 5 minutes late. In this storm of delays, that alone was a mammoth task. The feedback coming from UTA’s customer service department, through instant mediums such as direct customer cell phone calls and Twitter comments needed to be taken into account as decisions were made about whether or not to hold an already late train for transfers from light rail or bus. Most customers were unaware of the challenges to the whole system caused by such a brutal storm on our north end, especially those on the south end of our alignment. At least several of our trains (now working later assignments than they were intended to) needed to be taken out of service for refueling and time sensitive inspections. This was accomplished by making train swaps with “fresh” trains that were ready to go. Also of course getting the proper train crews on their proper trains was an on going process that took many hours to complete. It was over 8 hours after the storm (after I had gone home) when I finally stopped listening to the radio chatter. Even then, sorting out the aftermath continued. The three crossing protections, scattered in the storm zone, were still in effect when I turned off the radio and went to sleep. It literally took all night to get everything working properly again. Even though it might be fun to play Chess, “Railroad Control Room style”, for now I’ll leave it to the Railroad Chess Masters of FrontRunner. Because at this point, I’m having too much fun just driving the train. 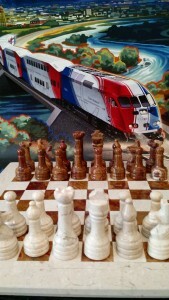 Well, if the rail yard work can be compared to playing checkers, with it’s billions of possible move combinations, then certainly railroad operations out on the mainline should be compared to playing chess with it’s trillions of possible move combinations. Conductors – Sometimes when we aren’t driving the train, as engineers, we work as conductors walking the train making sure everything is the way it should be. We are there to do everything from fix common door problems to getting on the ground to flag the train through malfunctioning crossings. Train Hosts – They are both at stations and on the trains, helping passengers. Field Supervisors – They work throughout the alignment doing everything from dealing with trespassers and other illegal activity to helping with the trains and the rail alignment locations that are having problems. MOW Rail (Maintenance of Way) – Personnel that maintains the rails, switches, etc. MOW Signals – Personnel that maintains the signals systems and automatic controls. Radio Technicians – Maintaining the many two-way radios in our operation as well as the automatic announcement systems on the trains. Frontrunner maintenance personnel – They usually work in the yard, but do venture out on the mainline when a train with problems warrants it. The Instructors – They have licensing authority (can issue and revoke our engineers licenses), give efficiency tests and check rides to determine if we are still doing everything correctly and if we can still keep our licenses or not, and teach the basics to new engineers. UTA Police and Fare Inspectors – Out there keeping everyone honest and safe. FRA inspectors – They can be anywhere at anytime watching our operation to make sure we, as a railroad, are following all Federal Railroad standards. Customers – And last but not least, I like to think of our customers, the passengers, as the King of our Railroad chess game, because everything else that the rest of us are doing ultimately is to take the best possible care of our passengers, just like the number one objective of all other chess pieces is to protect the king. I read that there are 318,979,564,000 (that’s almost 319 billion) possible ways to play just the first four moves of chess. I think this is a fair comparison our mainline railroad operations. Even when everything goes like clockwork, it’s a pretty complicated mechanism to run that “Clock”. Timing is everything, as the north and southbound trains meet each other. Typically this is at eight different locations along the alignment during our peak 30 minute service. All it takes is something like heavy passenger loads, taking longer than usual to board and exit at the stations, to really mess up the schedule for all nine trains competing for the same single track. Add to that a door not functioning properly or a million other mechanical glitches that can happen and the delays can really add up. Then the Grandmasters in the control room might start changing things up, trying to get the flow of trains down the track in both directions smoothly again. North vs Southbound “train meets” at the sidings may be switched, so that the normally faster train to the meeting point stays on the mainline and the normally slower train, which is now first to get there, goes into the siding and waits for the train to pass by in the other direction. That maneuver can help get the slower train back on schedule because it won’t have to slow down as it passes the train coming from the other direction. However even that can be tricky. Because the switches have to be lined well ahead of time and then the Controller is committed once he guesses which train to line into the siding. Other variables that affect the timing and flow of trains as they move in both directions along our single track include the fact that no two engineers drive the train the same way. Sometimes in the mix are new student drivers along with their instructors. Some engineers drive the trains faster than others. Some try to push the limits of our automatic speed controls and frequently get shut down. That makes them slower in the long run than those who go slower. Some engineers leave such a cushion of safety that they never hear the Cab Signal System beeping the warning that the train is going as fast as allowed for that particular stretch of track. I would describe these engineers as “Slow but sure”. As I drive my train, I strive to always run at maximum authorized speed by keeping the “happy chirp” of the cab signals going as much as possible but avoiding getting to the point of hearing the “angry beep” of that signal system saying, “I’m going to shut you down!” I’ve also learned that keeping a train on time has as much to do with efficiently coming into and out of the stations as with running at maximum authorized speed through the open stretches. All of it involves a fine line between great train handling skills and excessive penalty stops and causing a jerky ride for “The King” our passengers. It’s a lot of continuous practice and work to get it right. Also, no two trains can be driven exactly the same way. Our 19 locomotives and over 50 passenger cars are constantly being remixed and matched as units are pulled out for repairs or preventive maintenance. Each time a particular consist is changed it handles differently. Variables include locomotive power, exactly what is required to keep the Cab Signals happy, and how the train responds to braking. Form A Protection – Temporary speed restrictions because of track conditions. Form B Protection – Speed restrictions with possible stops required used to protect men and equipment working on or near the rails. Restricted Speed – Special reduced speed requirements that includes a mandate to watch for and stop before encountering a list of possible obstructions. Additional Speed Restrictions – Can be issued for any speed, for any stretch of track, for any time required, to protect either the train or men & equipment on the ground near the track. Crossing Protections – Special procedures including sounding a horn sequence and speed restrictions, with possible a stop for a flagger at crossings with malfunctioning crossing gate and/or lights. FrontRunner Efficiency Tests – Conditions in place on the train or track requiring the engineer to respond following specific protocols. These many different possible tests, administered under the direction of the training department can vary in complexity and delays to normal operations. Union Pacific Efficiency Tests – Same as the FrontRunner efficiency test when operating on the Union Pacific alignment. One big difference is the Union Pacific supervisor administering the test has less regard for the length and timing of the test that affects FrontRunner’s schedule. I’ve been involved with some of these tests that caused substantial delays to FrontRunner during our peak morning commute. Union Pacific Trains in Emergency – Because of the length and resulting cumulative slack action, when a Union Pacific train applies it’s emergency brakes (regardless of the reason), there is a possibility that their consist may become uncoupled or even derailed. When this happens on our adjoining track, it is possible that our track may be fouled by it. Also, the UP personnel must then walk and make a visual inspection of their train before they can proceed. We have special protocols to follow in how we can proceed past (and reporting about) the UP train as long as it’s in emergency. Police Action on the Train – Whether it’s someone running or hiding from police on the train, or someone is observed engaging in something criminal, the train may be asked to hold at stations while the police do their thing. Police Action on the Alignment – The various police agencies along our alignment will contact our control center anytime they have police action along the alignment. We will then be asked to proceed with various levels of caution (and reduced speed) depending on what is going on and how close they are to our rails. It is surprising how often this happens. Criminals and good people doing dumb things seem to gravitate to the railroad tracks. Medical Emergencies on the trains and at stations – It happens, and does cause the delays you might expect for such things. Bomb Threats – From a positive perspective, the traveling public are increasingly aware of their surroundings. The “See something, say something” awareness campaign is working. I’ve even had my own bag, locked the operating compartment of the train but seen through a small window, reported to me as an unattended bag. Even though it requires man power and other resources, usually the frequent sightings and reports can be quickly investigated and resolved without causing delay to the trains. However, even in my short time working for FrontRunner, I’ve seen these sort of threats close down a station and shutdown and evacuate a train. In the latter case, apparently a homemade tattoo machine, forgotten and left on the train, can look a lot like a bomb. Cars crashed or stranded on the rails – It is surprising to me how often confused, impaired or reckless drivers end up stranded on our rails. Of course this brings disruption to our regular train service, while the incident is investigated and the car is cleared from our tracks. One such incident recently happened on our main line tracks next to our rail yard. The innovative way that our controllers kept our trains rolling, and kept our “King” the customers happy, seemed as clever as the unique castling move in chess where the King is protected by simultaneously trading places with one of the rooks. In our railroad version, our “in service trains” full of passengers, were routed through our yard, thus avoiding being stopped on our closed mainline track. Besides the yard speed restrictions and personnel out throwing yard switches to accommodate their movement, the jurisdiction and communications for the train moved to the yard supervisor and then back to the controller as each train made their “Castling” move. Debris on the tracks – Certain types of debris (blown, dropped, or otherwise left on the tracks) can show “an occupancy” and require investigation before the signal systems are working properly and trains can proceed normally. Disabled train on the alignment – Nothing will disrupt the flow of all the trains running up and down our single track quicker than a disabled train anywhere on the alignment. Frequently, the mechanical problems occur at a station with things like door problems. If something happens causing the train to loose power between stations, the goal is to coast into a station so at least other trains can continue to run down our single track. When that doesn’t work, it’s really inconvenient. Bus bridges around the disabled train and the trains on both ends of the “blocked track” running back and forth on the shortened remaining line then become a reality. Train involved in collision with a person or vehicle – These events, almost always including personal tragedy will stop the train at the scene for hours. Like the disabled train on our single track, bus bridges and the remaining trains making shortened runs on each end of the accident to keep our passengers moving. Extra trains – Whether it’s a single locomotive sent out to rescue a dead train on the alignment, a replacement train to replace one with problems, or an additional train sent out to take up the headway of a substantially delayed train, the extra trains out competing for our precious single track during our peak 30 minute service can really complicate routing and flow of the other trains. Snow storms causing Signal issues – All the switches on our mainline are equipped with heaters to keep them from freezing in cold and snowy weather. In spite of our fancy equipment and all that the Maintenance of Way personnel do to keep these things working, stormy weather always seems to break the weakest links in the chain. The results include stopped trains, engineers tying down their trains, trudging out in the snow to manually throw switches, and a whole list of special radio dialog mandated to keep the system safe while trains begin moving (albeit slowly) through a manual system. Power Outage – Though the specific cause is different, switching and signal issues when the power goes out along the alignment is very much like what happens when snow storms cause havoc with our mainline switches and signals. Tripped Bollards – Bollards are posts mounted in certain places between our rail and very close Union Pacific track. If in these very “tight spots” a UP train (or something from the UP train) trips the bollard, it falls over onto our track causing any of our trains in that area to receive a “Zero Speed” on our cap control signal system, shutting down that train completely. MOW (Maintenance of Way) with Track & Time or Foul Time – Whether it is preventive maintenance or helping to get things up and running when the system fails, The controllers must also keep track of MOW personnel out on the track as well as the trains. Depending on what they are doing, when, and where, various types of permits are granted, and monitored by the controllers so that the trains and employees who maintain the track system don’t occupy the same space. Common Corridor Emergencies – When the emergency is bigger than just FrontRunners’s world, coordination in responding to, and managing the situation includes the other outside entities involved. Just recently, an I-15 wreck, involving a truck with potentially explosive material not only shut down the interstate in both directions for many hours, but also closed a close by section of the FrontRunner track. Like a disabled train on the alignment, Bus Bridges and trains makings shorter runs back and forth on each side of the track closure were included in the responseshe included in the responce de of the track closure also closed a that the Controllers made in that particular railroad chess game. Trespassers – People along our rails is a constant occurrence. Many don’t seem to know that they are trespassing into dangerous territory. Others know but don’t care. Whether it’s just someone looking for a short cut, a foamer out trying to get the perfect picture, or someone with a death wish, they complicate and often slow our safe passage up and down the rails. Train Host left at the Station – In the hustle and bustle of passengers exiting and entering the train, once in a while the train host, buried in the crowd, is left on the platform (often standing there holding the bridge plate that was just used to help someone in a wheelchair cross the gap from the train.) Once the train is off the platform it can’t go back, and the controller now needs to get another train host on board, somewhere down the line, until it can all be made right again. Holiday “Saturday Service” congestion – Even late at night on a Monday holiday, Controllers deal with congestion along the alignment as the late night “Saturday Service” trains continue until 2:30am, the five overnight trains are deadheading to their starting points in Provo and Ogden, MOW is looking to get on the tracks for inspections and maintenance, and the overnight freight trains are looking for their usual night time windows of opportunity to cross over the UTA Main track as they service the many businesses along both sides of our rail. No! Even though the yard can be that quiet at times, this story isn’t about how we sit and play Checkers and Chess all night. They say that there are literally billions of possible moves in a single checkers game. I think it’s a fair comparison to the possible moves on any given work shift in the rail yard. Even in our small rail yard, with only twenty-two tracks, and a shop with eleven tracks running into or through, the work that may be needed 24/7 is endless. Moving various railcars and locomotives as required for the maintenance personnel. Breaking up trains for (and building trains after) detailed preventative maintenance work. 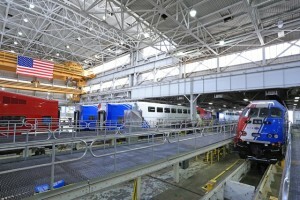 Staging trains in the yard for the next pullout (beginning of service). Testing trains, both on yard track and out on the mainline after certain repair work is completed. All the associated manual switch lining in the yard for everything listed above. On stand-by to go out in the mainline, with no previous notice, if a scheduled engineer is a no show, late, becomes sick while out on the mainline, etc. On stand-by with replacement trains to bring out onto the mainline to swap out trains experiencing mechanical problems. Like in checkers, some movements can only be made when doubled up. While some of this work can be completed by one engineer, other jobs requires at least two or sometimes three to follow all the safety protocols. Work directly in front of, behind, or under any part of a train requires some form of protection. For engineers, the mandated protection is to have another engineer guarding the controls with it locked into what we call “Set and centered”. When coupling or uncoupling a locomotive or railcars, the engineer needs to follow the directions of another engineer on the ground watching the move. Sometimes three engineers are required so both ends of the train can be watched while making the move. And always, any movement that is not forward, and with a clear view for the engineer, requires that another engineer is stationed to watch, and to “call the shove” movement. Like in checkers, the various combinations of everything that might take place during a “report shift” in the yard can easily number in the billions. No two days are exactly alike. The busiest “Overnight Report Shift” I’ve ever experienced occurred soon after I was licensed. My scheduled start time was 8:00pm. And in this case I was the only engineer scheduled for the yard that night. Of course, like always, I was substantially early. As soon as I arrived, I was asked if I wanted to start early because they needed me out on the mainline. I was immediately driven 20 miles south to meet a northbound train that was lacking a conductor. By the time the train reached our rail yard, they had a replacement for me and I was back in the yard. Because I was the only one on report in the yard, I wanted to be ahead of the game on everything I could think to do, so I headed out to inspect and line the track for the “Pull in” which would start shortly after midnight. I only made it halfway into the south yard when “Control” called me on the radio and told me to get the spare train ready for a northbound departure. This meant that a train on our north end was having mechanical difficulties and just in case they couldn’t resolve it, I needed to be ready to go out on the main line with a rescue train. Getting the train ready included turning on power for each car, starting the locomotive, firing up the HEP (the train’s electrical generator), starting up the locomotive and building enough air in the system for operations, “Cutting Out” the Cab car (for Southbound movement) and “Cutting In” the Locomotive (for Northbound movement), and performing the required brake tests, which included a lot of walking back and forth to visually confirm that the brakes were doing what they should when brakes were applied and released. By now Control informed me that they did in fact need my replacement train out on the mainline ASAP. I still had to manually line the yard switches for my northbound departure and go back into the operations room for my backpack (which has all my required paperwork to drive the train on the mainline). It’s surprising how long all that takes to do when you have to do it by yourself. Finally, I was back out on the mainline, this time driving the train. We made a “Train Swap” where the train crew and passengers continued north in the train I brought to them, and after all the needed brake tests, I “limped” that train back to the yard for repairs. In this case, the broken train could not proceed northbound, but by cutting out the locomotive and cutting in the cab car, I could still drive it southbound. Direct incoming trains where to go as they enter the yard. Line the track for the next train as each one enters it’s designated track. Help tie down each train when it comes to a stop. Line track for each train to move out of the servicing bay and to it’s parking place. Test the repaired “Broken train” from earlier with movement through the rail yard. Move each train out of the shop and to their parking place as maintenance releases them. Continually reline track as each train moves back and forth to reach it’s correct parking position. After moving each train out of the shop, drive the next one waiting behind it into the shop so maintenance can service, clean, and inspect. Each time I have a train to move, specific protocols must be followed including walking the entire consist and releasing several hand brakes. Of course all of this is done in the dark of night and on hard to walk on “ballast” rocks that the railroad tracks sit on. Like in my best attempt at playing checkers, I was always thinking as many moves ahead as possible. After tying down this train, here in the east yard, do I have time to walk back and line the track of the east and north yards for the next train out of the shop? Or should I cut straight across to the south yard to line it for the next inbound train and then move the next train in cue to the waiting servicing crew? Sometimes a little delay now will save a lot of time later. Even for someone who’s not afraid to walk a lot, and in fact in the habit of running about 10 miles in my off duty time, this was a very busy night of work. By 6:00am, the end of my shift, I was dead tired.